The Seminar of Excellence on “Political Systems in South East Europe” took place in Tirana on 25-26 May 2017. 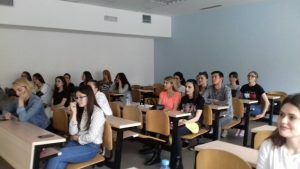 This SoE was co-organised between PoSIG Lecturers: Dr. Bojana Noumovska from the Institute for Sociological, Political and Juridical Research in Skopje (UKIM) and Dr. Nysjola Dhoga, Faculty of Social Sciences, University of Tirana. The SoE focused on electoral systems in South East Europe with an emphasis on ethnic parties and the case of Macedonia. The political system in Albania, in comparison and contrast with the Macedonian case, was also discussed. The SoE started with a presentation of PoSIG for increasing the awareness of the project to the bachelor students who showed their interest to apply in the master program in the near future. The activity was also a good occasion for the lecturers and institutions of the two countries to exchange their teaching and research experiences and to increase their collaboration in the framework of the project or future activities.